I can’t believe how time has flown by since this magnificent wedding! Our couple, Kirsten & Rich, we’re so incredibly wonderful to work with! Their February nuptials took place at St. Margaret Mary in Winter Park, and were followed by a reception at the Portofino Bay Hotel at Universal Orlando. Kirsten was a vision in an elaborately beaded Lazaro gown; bridemaids and groomsmen looked very sharp dressed in black for this formal, evening affair. 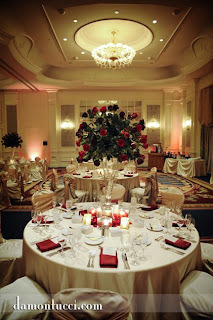 Kirsten’s overall vision for the reception was a warm and romantic setting incorporating both traditional and modern elements: red roses, hanging crystals, the glow of candle light, satin finish linens and dramatic lighting. Additional images from this event are featured on our website: Featured Affairs – Romance & Splendor Photos courtesy of Damon Tucci.